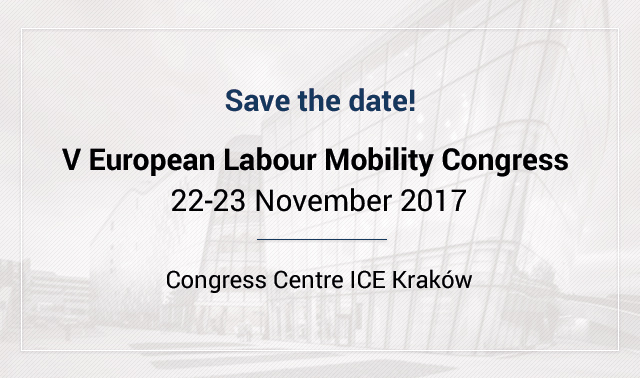 On 22-23 November in the Kraków Congress Centre ICE will be held the 5th edition of the European Labour Mobility Congress, the biggest European conference on provision of cross-border services in the EU and the posting of workers. Polish Ministry of Economic Development will be co-hosting the event. As in previous years, it will bring together the representatives of business, firm owners and managers, lawyers and practicioners, the decision makers who have real impact on the lawmaking and interpretation as well as the politicians and experts. – This year the Polish Ministry of Economic Development will be co-organizing the Congress. It confirms that the export of services within excercising the freedoms of the EU market is very important for our country.” – says dr Marek Benio, Chairman of the Organizing Committee. Traditionally, the first day of the congress will be dedicated to the political issues, and the second – to the business ones. The first day of the Congress is an opportunity to extend your knowledge on the direction of the works on revision of regulations on the posting of workers abroad, discussions conducted in particular countries about protection of local labour markets, ‘social dumping’ and unfair competition. Top politicians and officials will take a stand. In the programme, there is a place provided for the representatives of employers and workers, who specialize in the issues related to the provision of services in the EU. As in the previous years, among the invited guests there is i.a. Marianne Thyssen, the Commissioner responsible for the revision project of the Directive on the posting of workers and Regulations, based on which the social insurance institutions issue the PDA1 forms. The second day is dedicated mainly to the employers sending their workers abroad. The agenda includes a series of practical workshops, conducted by lawyers practicing the labour law and social insurance in Poland and countries to which most of the workers are posted by the Polish companies (Germany, France, Belgium). Each year, one of the most popular is the workshop by Anna Siwiecka from Polish Social Insurance Institution (ZUS), who is in charge of all procedures and rules of issuing the PD A1 forms by ZUS branches in Poland. what legal changes will affect the companies operating at the Internal Market? what new barriers the Polish companies will have to face? what formal requirements have to be met in case of sending a worker abroad to avoid fines? is delegation also posting of workers? These questions will be answered by our experts on the second day of the fifth European Labour Mobility Congress. – In European Commission’s interpretation, every worker going abroad, even for one day, is a posted worker. Not meeting the formal requirements are threaten by high penalties, which the host countries are eager to enforce. The Congress is a source of information for the companies willing to find themselves in a rapidly changing gloom of European regulations. – says Stefan Schwarz, President of the Labour Mobility Initiative, which organizes the event.